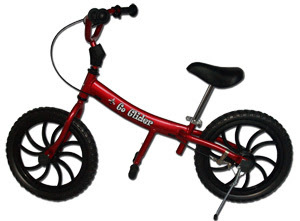 Check out our newest balance bike at Kids Balance Bikes.com! I’ve been wanting to have a 16 inch balance bike for all those kids too big for the standard balance bikes out there. The highest the standard balance bike seats go is 18.5 inches (and some to only to 16.5). So if you child is 6 or older, they may be too big for a standard balance bike depending on their height for their age. I’ve demoed with some really tall 4 1/2 – 5 year olds (who are a 6T or bigger) who towered over the average balance bike and so wished I had something to offer them. Now we do. Kids Balance Bikes always tests out their bikes before selling them and often sells them to local kids through demo rides and street fairs. What I loved most about the Go Glider after we first got it together was HOW LIGHT IT WAS! It did not seem possible to be so light – only 10 pounds. I was also excited about the options the bike offers. There are great foot pegs to rest your feet on while you glide. I’ve had people question if they liked this. Well, they come right off if you don’t!! Without any tools! The kickstand is also easily removeable if you do not like it. The tires are EVA foam – a very solid material found in the Strider balance bikes and offers no flats ever and always ready to ride with a firm tire. Air tires need to be inflated about twice a year. My demo striders which I’ve had for over a year and ridden by 100’s of kids never have needed new EVA tires. This leave a light, simple frame with one handbrake. Very easy to get on, manage, and build confidence as the child moves around. Also, it comes in RED, BLUE, and PINK! If you like this bike but your child is not yet wearing a size 6 clothing – then look at the miniglider bike which is the exact same bike but in a 12 inch frame. Don’t get a bike that your child will “grow in to”. These bikes are for the here and now! Get them the correct size that will give them immediate confidence and control and they will thrive! 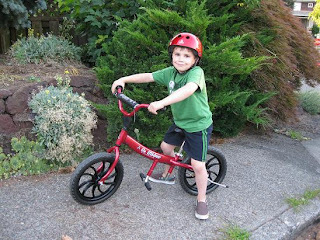 If you need more help with sizing, contact Kids Balance bikes at 503-709-8782 or see our recommendation chart on our website. My son currently has a Like-A-Bike “jumper” but has out grown it. I have been looking for something bigger but the bigger balance bikes are all wooden and not appropriate. He has a muscle wasting illness – Duchenne muscular dystrophy and as a result cant pedal a “normal” bike, this is why his Like-A-Bike has been invaluable. Is there anywhere in the UK that sells these Go Gliders, or can they be shipped? Thanks for your question! The Go Glider is not sold out of the US and would be expensive to ship and you would run into import tax fees. There is a web company who will ship it internationally http://www.countrymousekids.com. The Like a bike has a 16 inch wooden balance bike called the Maxi and is coming out with a 16 inch metal balance bike soon and if you can get Like a bike in the UK that might be cheaper – though they can be spendy. Another option would be to buy a 16 inch pedal bike and have a bike store take off the pedals, cranks, and chain and it would basically serve as a balance bike. Older children can handle this set up, where younger children do not have the strength or height. It is worth a try and a much cheaper option.